As a true steakhouse, we offer patrons the finest cuts cooked right to order and served with mouthwatering tenderness. For a true taste of the gastronomy of Argentina, try our mata hambre, and complement it with one of our homemade pasta dishes. Don't forget to ask for our famous, homemade chimichuri sauce to top off your steak or use as a spread. 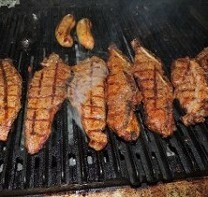 Other popular items include the Churrasco Argentino and bife de chorizo, a 16oz. New York Strip. Go on a mini trip and back with Parrillada Argentina. This grill platter comes with a variety of meats, including two short ribs, two flank steaks, two pieces of a New York strip, two sausages, a tasting of sweet breads, black pudding, and some small intestines. This platter feeds two really hungry adults or up to five people, and is perfect for sharing. Contact us to try our authentic Argentine cuisine, or our special Parrillada Argentina.